After starting the game, click "Quick battle". In the window that appears, configure the settings as desired. I chose the side of Iraq (1) against Iran (2) and set the default camouflage (19, 20). Proceed to the deployment of forces by clicking on the second button from the left on the bottom panel. Select the cell around which the battle will take place (left click on it). Place your subordinates. 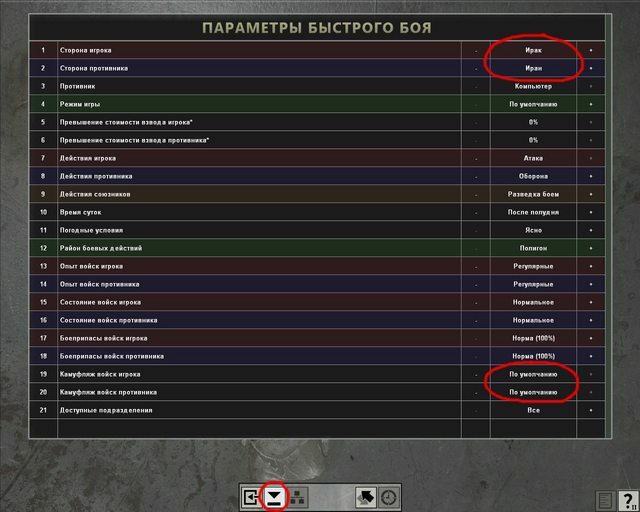 Select the desired platoon from the list on the left and place it by left-clicking at any point of any green cell. 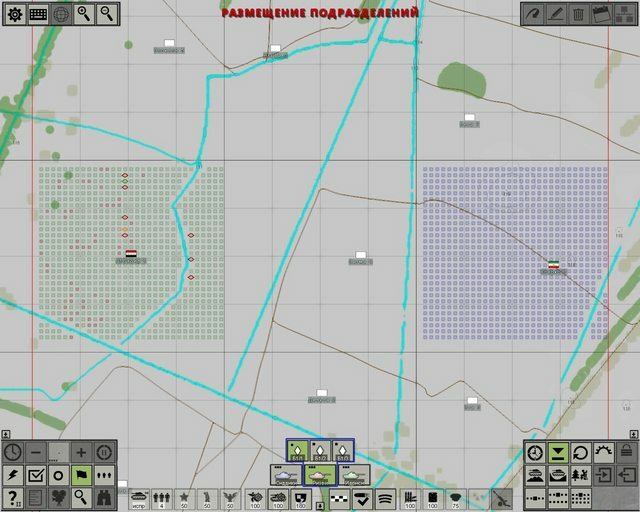 The icon of a man indicates platoons, which the player can control. I placed three T-62 platoons in one cell. ... start the battle by clicking on the fire icon. 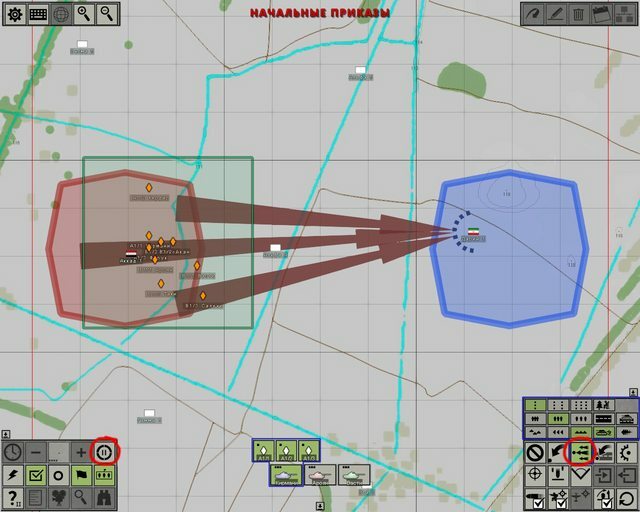 Deployment of forces mode. There is currently no need to invent anything, just leave the mess that has turned out after the start. Go to the next mode by pressing the clock on the bottom right panel (or simply Enter). Initial orders mode. Box select the mess and give the attack order (bottom right panel) somewhere in the enemy cell. Press the "pause" button on the bottom left panel (or Enter). The battle begins! Initially, we start at commander's place. But enough of the command, so switch to the gunner by pressing F6. Don't lose time, immediately give the order to start loading the gun: select APDS - key 1, start loading - R. Look in sights - V key, switch zoom - Tab, look closer - Backspace. 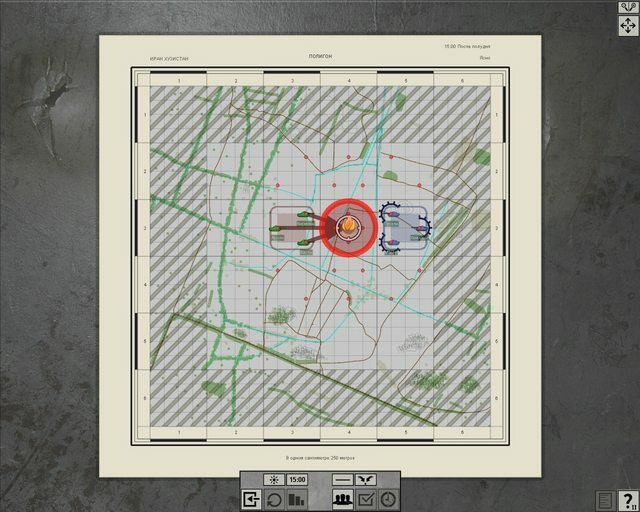 Set battlesight range (1900 m) with mouse wheel or Page Up and Page Down keys. 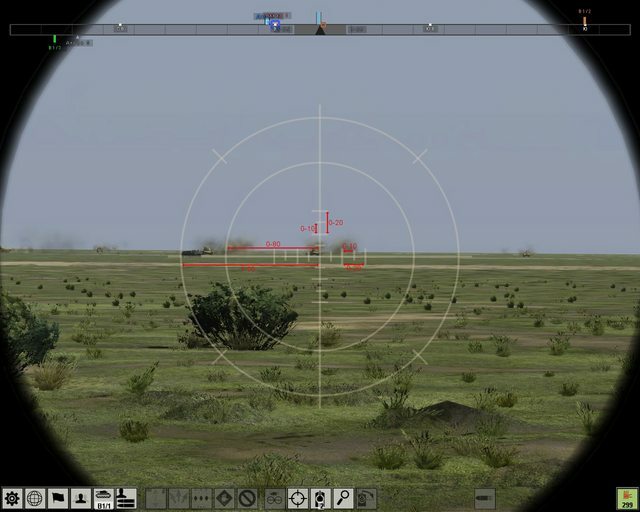 Aim the gun using mouse, fast rotate the turret and gun - cursor arrows. 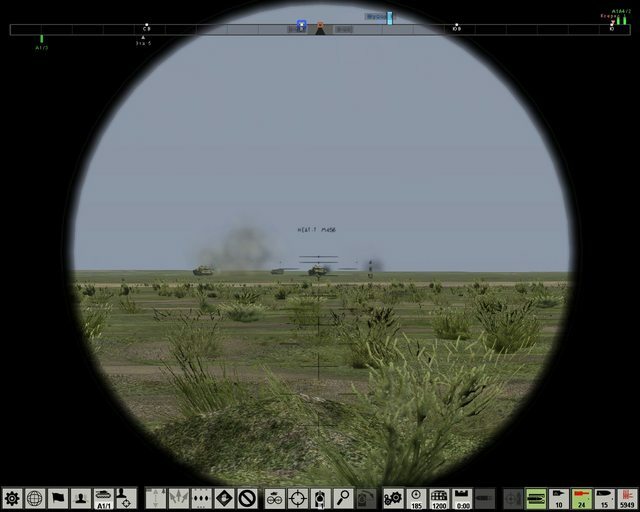 Fire from the gun - left click, coax machinegun - right click. 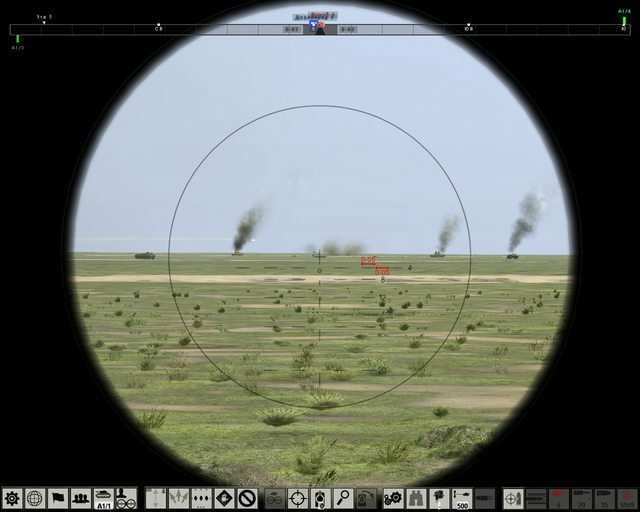 Since you'll be firing within battlesight range, aim at the base of the visible target. 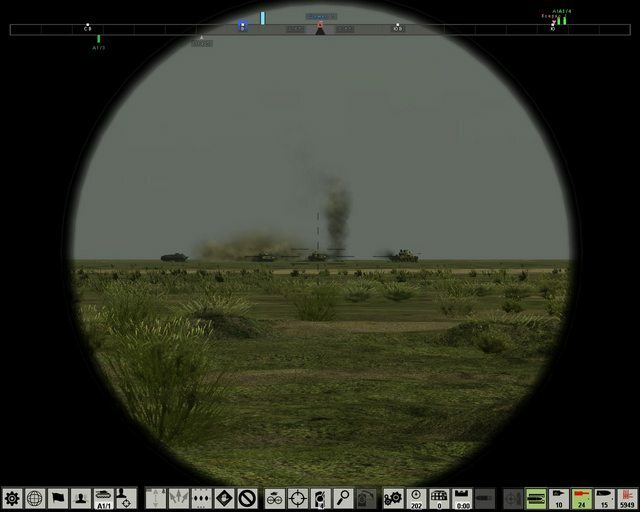 The screenshot shows how it approximately should look. 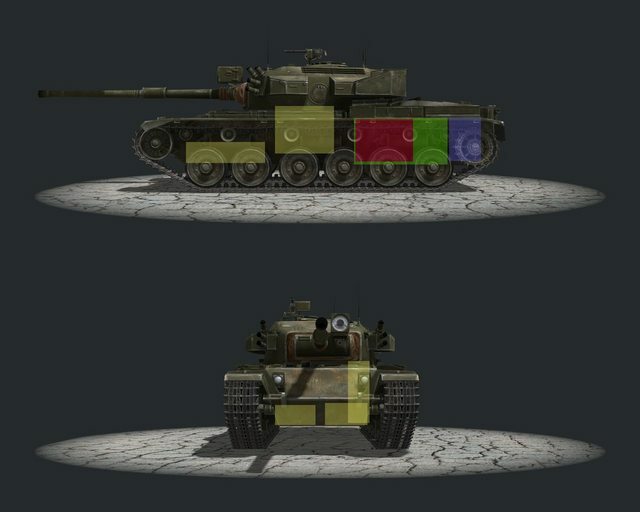 If it is hard to aim, you can press E key - short stop - after firing the tank will continue to move. Last edited by Krabb; 11/29/12 04:57 PM. The more of these the better to help people get started. Last time we decided to rely on chance and leave the forces in a disorder. Now we will master the deployment in our own way. To avoid unnecessary map clutter, disable the briefing - F7, as well as markers - F6 (it will be possible to get them back by pressing F6 once for individual markers or twice - for group markers). At the bottom there is unit selection panel. Select the commander of the first platoon. By default, we are in unit placement mode (marked button on the bottom right panel). 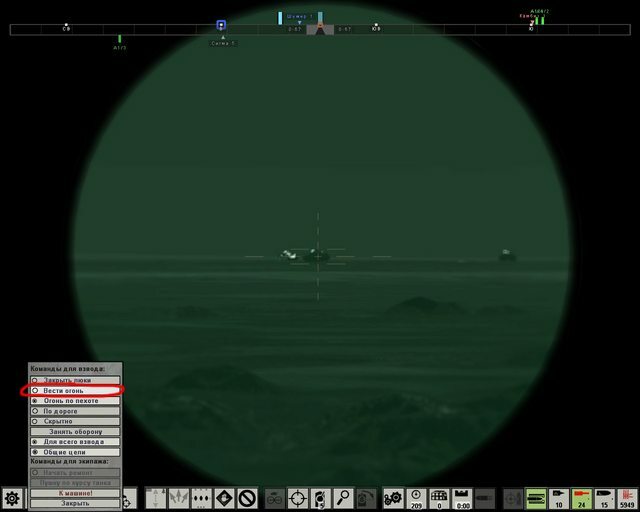 Relocate the commander by right clicking on the target point. 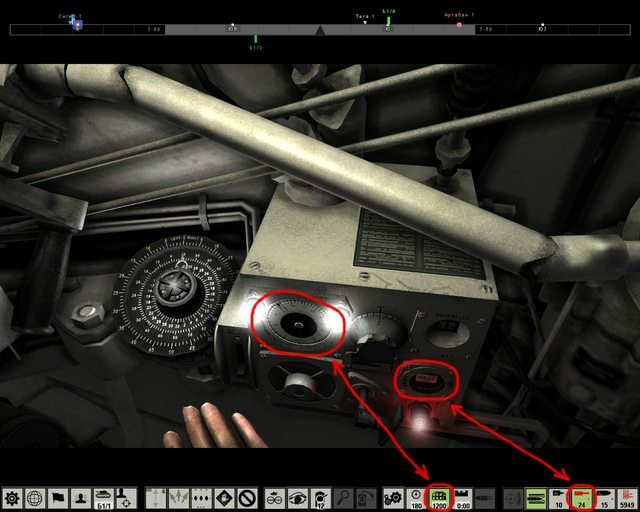 If you "stretch" the cursor in any direction holding the right button, you will see a green arrow indicating the direction in which the unit will turn. Place the platoon in a line by clicking on the marked button on the bottom right panel. Repeat the procedure for the second and third platoons. 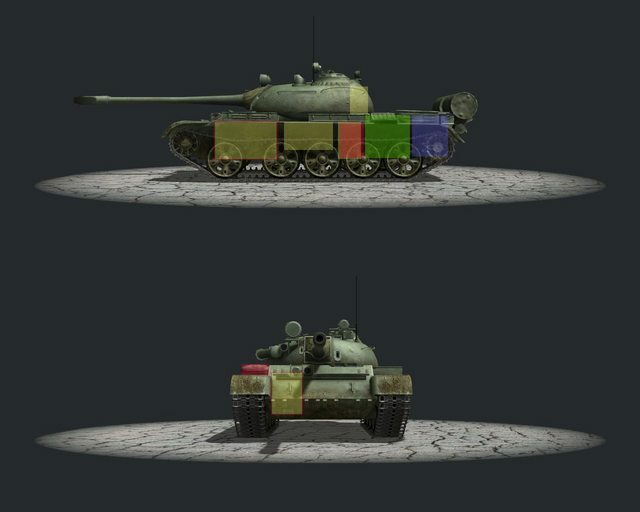 As you can see two tanks appeared a little aside. Fix it. 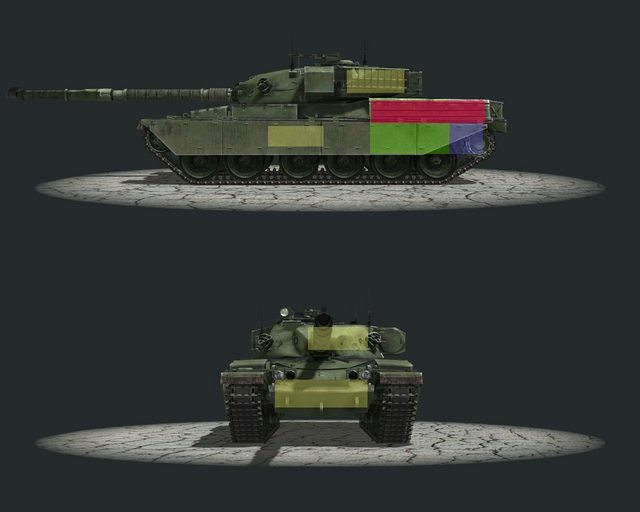 Choose one of the tanks, and Ctrl-select the other. Right click at a point just below the middle between them, in my case it is indicated by a small blue circle. Unit rotation mode. Select all units and switch to this mode by pressing the marked button on the bottom right panel. Right-click to set the direction in which units will turn. Here's how it should look like. Last edited by Krabb; 11/29/12 04:59 PM. Feel free to steal butcher modify and amend this if it might save you some time regarding t62 aiming. Thanks for the feedback MarkL and Skimbo! 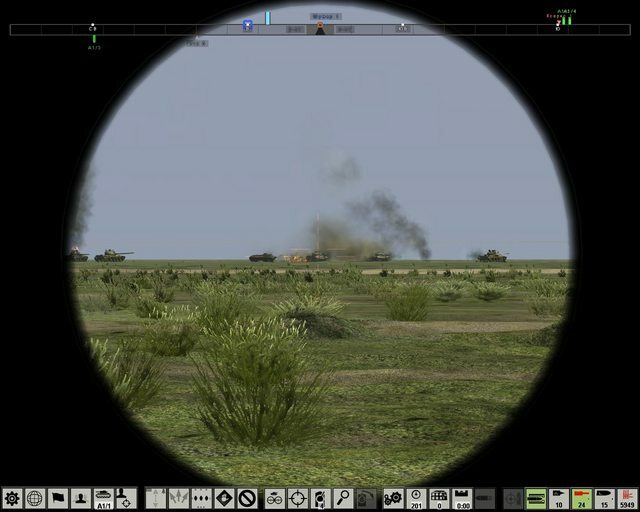 I'm actually translating my tut from Sukhoi.ru: http://www.sukhoi.ru/forum/showthread.php?t=74674. But I'm open for suggestions, criticism and such. You are doing great - keep it up! The bar at the bottom right displays the selected shell, the status of "load" command and the number of available shells. 3 - high-explosive plastic tracer (HEP-T M393A1). 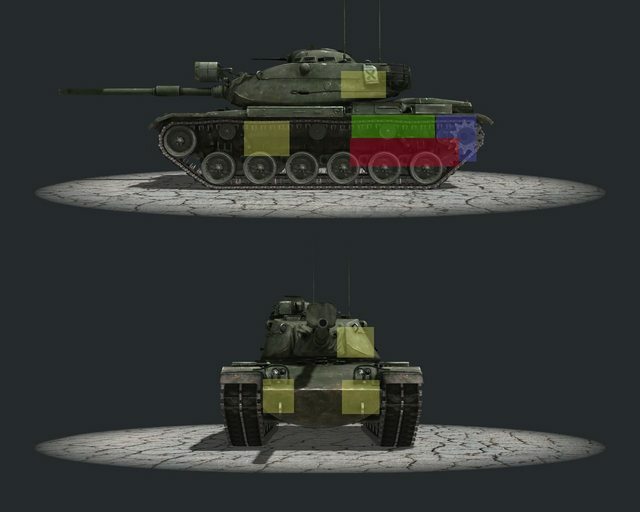 In addition extra shells are available - their presence is indicated by a small triangle on the icon of the shell. 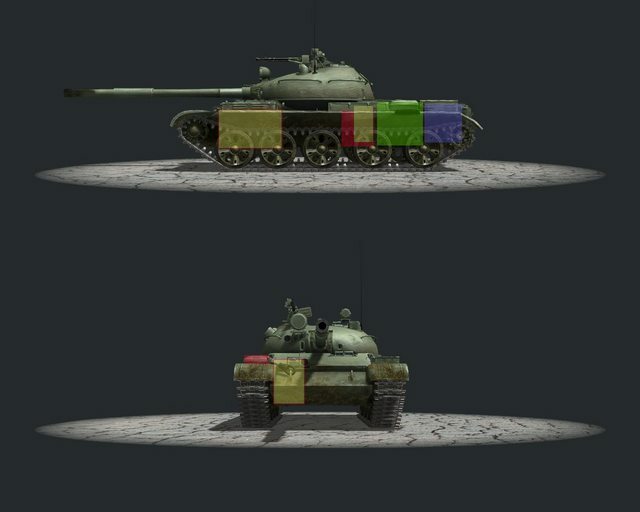 By right-clicking on the icon with such triangle, you can switch between: high explosive anti-tank tracer (HEAT-T M456) and white phosphorus tracer (WP-T M416), as well as between high-explosive plastic tracer (HEP-T M393A1) and anti-personnel tracer (APERS-T M494). Pressing R key commands the loader to start loading until all shells are exhausted or until the cancellation command (by pressing R again). 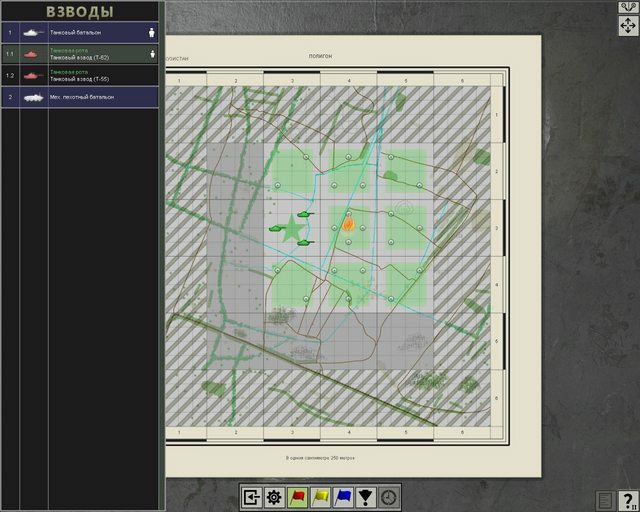 Pay attention: the selected shell is also indexed in the ballistic computer, therefore do not select another shell ahead of time! 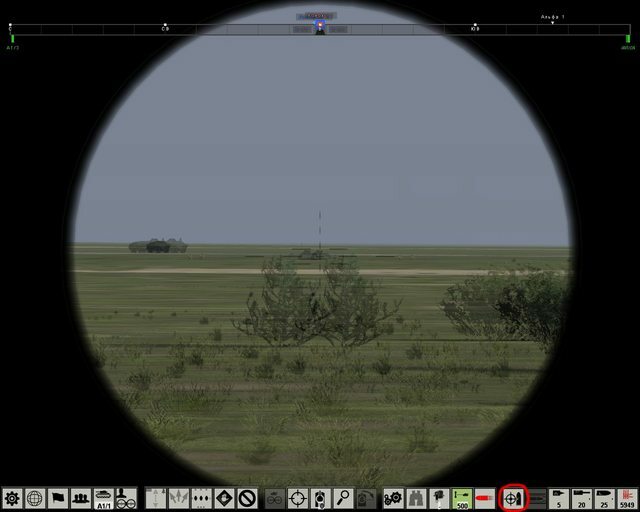 For APDS-T M392 battlesight range is 1600 m, for HEAT-T M456 and HEP-T M393A1 - 1200 m.
Index battlesight range in the ballistic computer - press N and set the range by rotating the mouse wheel or by pressing Insert and Delete keys (hold Shift for larger steps). Look in sights - V key, switch to the nonballistic reticle - Z and C, look closer - Backspace. Aim at the base of the visible target. 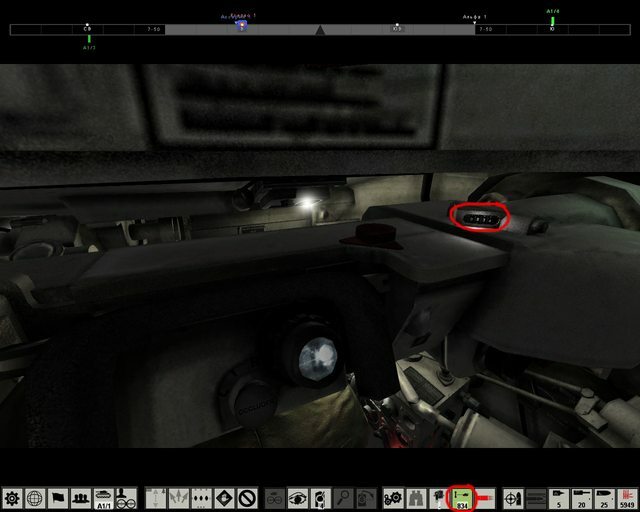 To turn off/on the ballistic computer, hold Ctrl to show the cursor and click on the ballistic computer icon on the bottom bar. 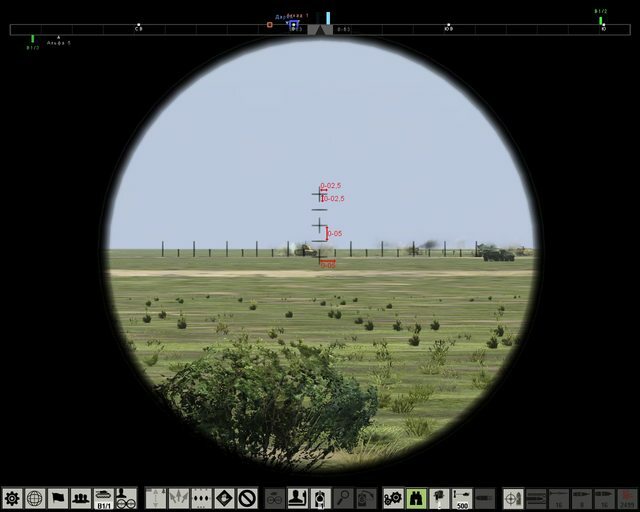 Switch to the ballistic reticle - Z and C. Place the range line corresponding to battlesight range of the selected shell on the base of the visible target. APDS-T M392 and HEP-T M393A1 scale. HEAT-T M456 scale. 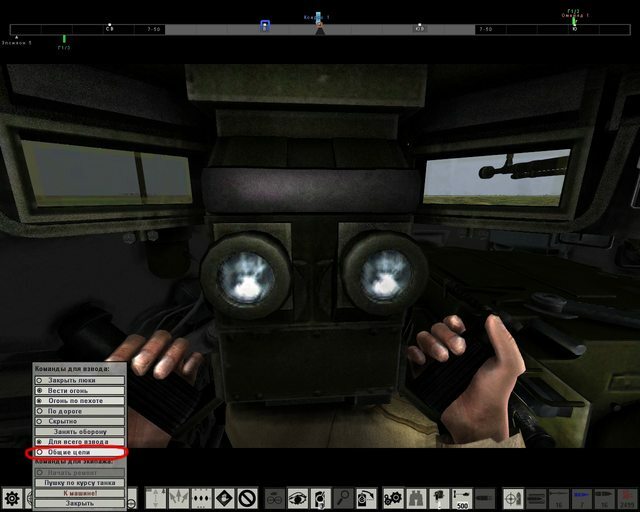 Switch between scales for different ammo types - G.
Hold Ctrl to show the cursor and click on the target. 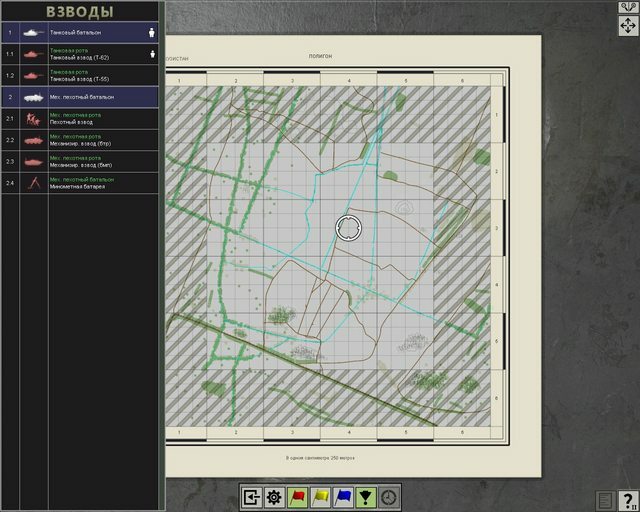 The commander will determine the range, it will be automatically indexed in the ballistic computer. For nonballistic reticle (switch to it with Z and C) the aiming point is the center of the target. 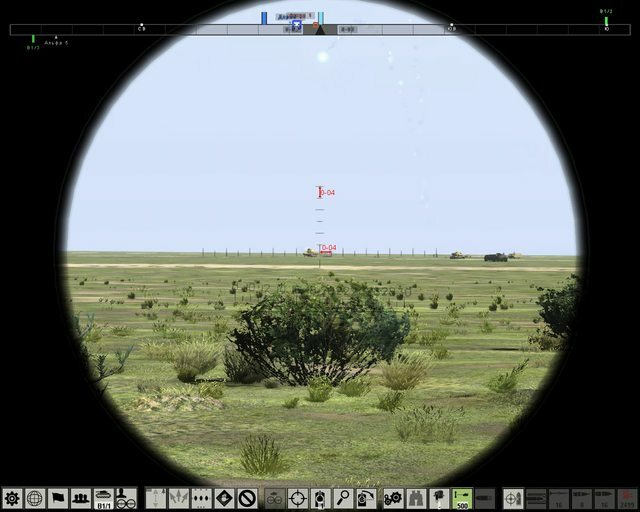 Blue triangle on "binocular" icon indicates that the commander sees the target and can determine the range. 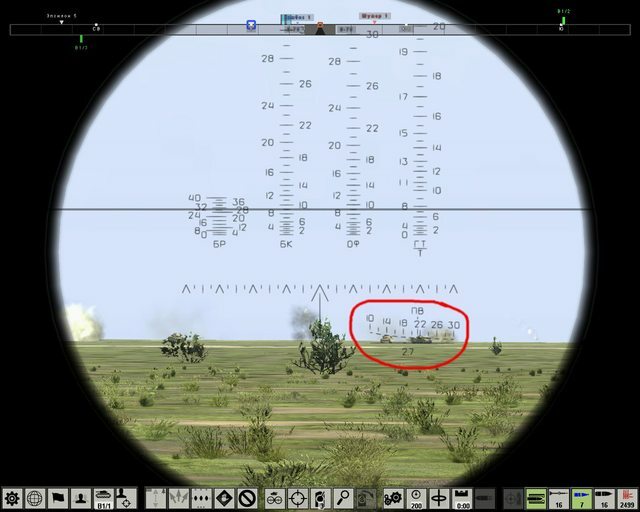 Clicking on the target designates it for the entire platoon by default. To avoid this, press ` key (left of 1 and above Tab) and disable shared targets. 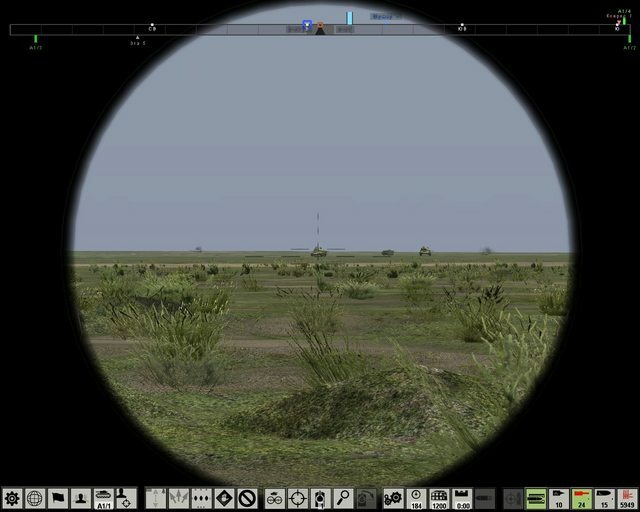 For ballistic reticle place the range line corresponding to the determined range and the selected shell on the center of the target. 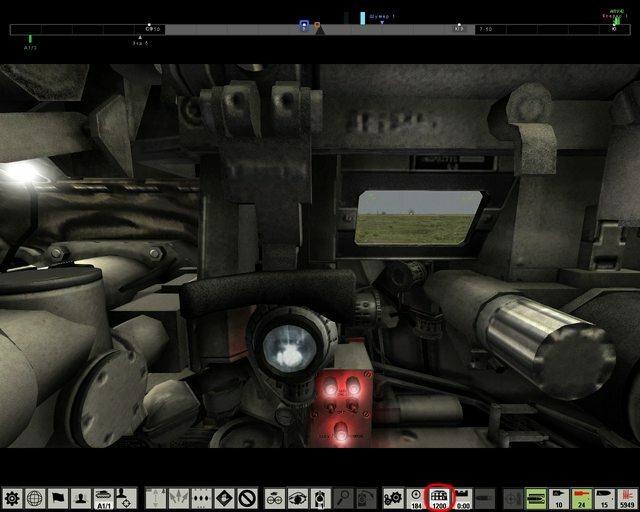 You can view the range indexed in the ballistic computer and determined by the commander on the marked icons. 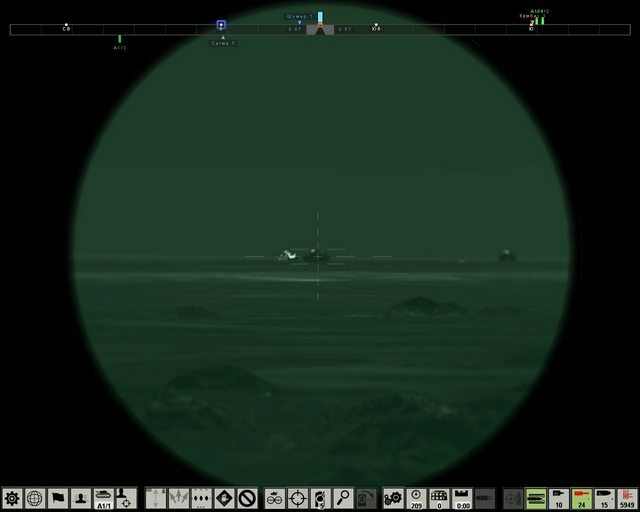 In poor visibility you can turn on a light filter - F and reticles highlight - H.
At night targets are illuminated by the xenon searchlight mounted coaxially to the main gun. 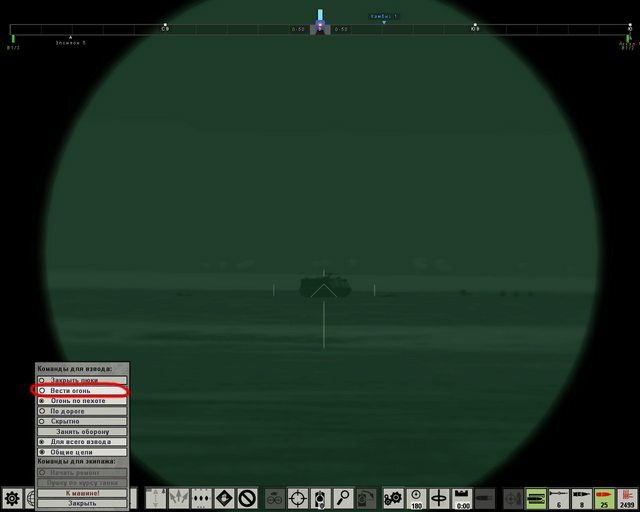 Of course, the enemy can see the searchlight too, therefore you can turn it off by pressing ` key (left of 1 and above Tab) and prohibiting the firing (see screenshot). 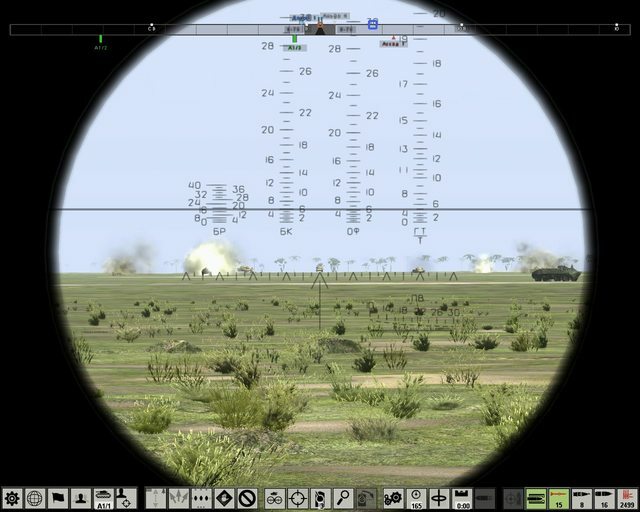 View through sights deteriorates significantly. Fire from the gun - left click or Space, coax machinegun - right click or Q. 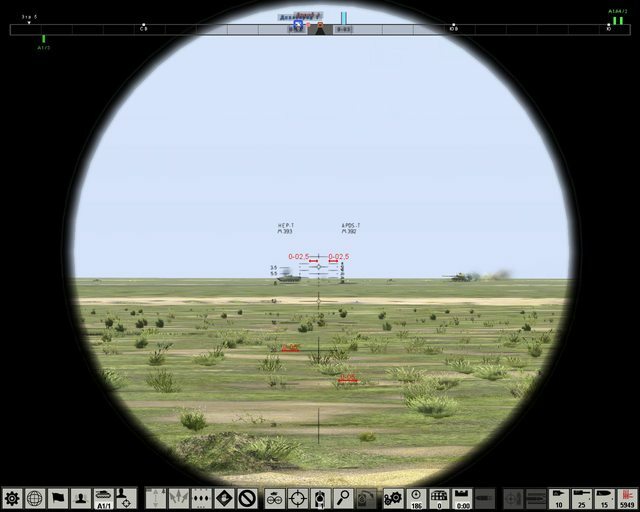 For coax MG for the ballistic computer you can use HEP-T M393A1, or use its scale on the ballistic reticle. Last edited by Krabb; 11/29/12 05:02 PM. Gosh, this forum doesn't have tables? My penultimate lesson will be UGLY. Lol - good work krabb. Can't wait for next tutorial. 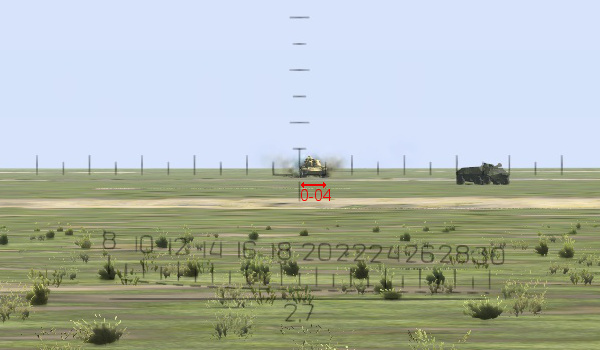 T-62 has a stabilized horizontally and vertically main gun (and coax machinegun), which enables the gunner to track and fire on the move with significantly improved accuracy. To turn it on and off press N key. 3 - high-explosive fragmentation fin-stabilized (HE-FRAG-FS 3OF11). 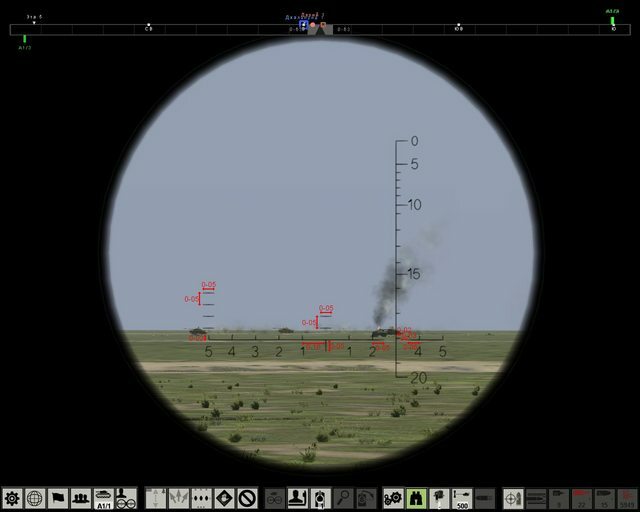 For APFSDS-T 3BM3 battlesight range is 1900 m, for HEAT-FS 3BK4 and HE-FRAG-FS 3OF11 - 900 m.
Look in sights - V key, switch zoom - Tab, look closer - Backspace. Set battlesight range for the selected shell with mouse wheel or Page Up and Page Down keys (hold Shift for larger steps). Aim at the base of the visible target. At the bottom right of the sight there is range estimation stadia set for a 2.7 m high target (average tank). To determine the range to the target center the full height of the target between the stadia lines, so that it touches both lines. Read the range, in 100s of meters, on the upper stadia line where the top of the target touches the upper line. 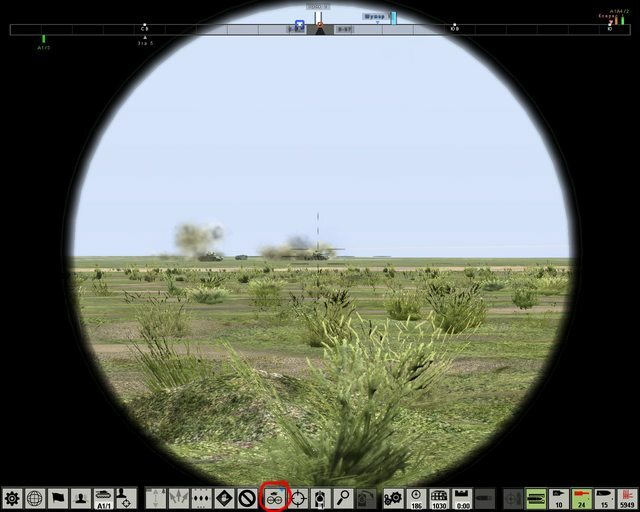 In this case the tank (the left one) is at about 1400 m.
Hold Ctrl to show the cursor and click on the target. The commander will determine the range. Set it for the selected shell with mouse wheel or Page Up and Page Down keys. Aim at the center of the target. You can view the range determined by the commander on the marked icon. 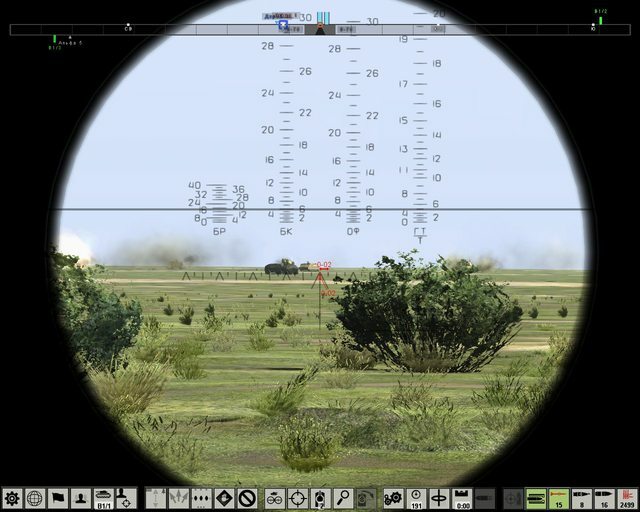 Blue triangle on "binocular" icon indicates that the commander sees the target and can determine the range. 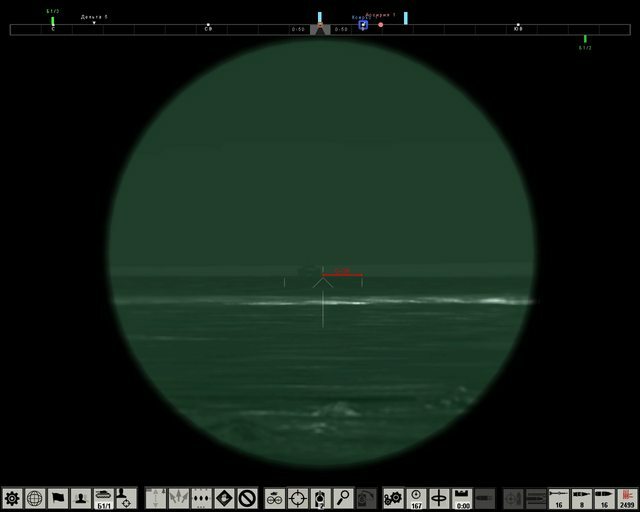 In poor visibility you can turn on a light filter - F and reticle highlight - H.
At night you are using TPN-1-41-11 sight, targets are illuminated by searchlight with IR filter. 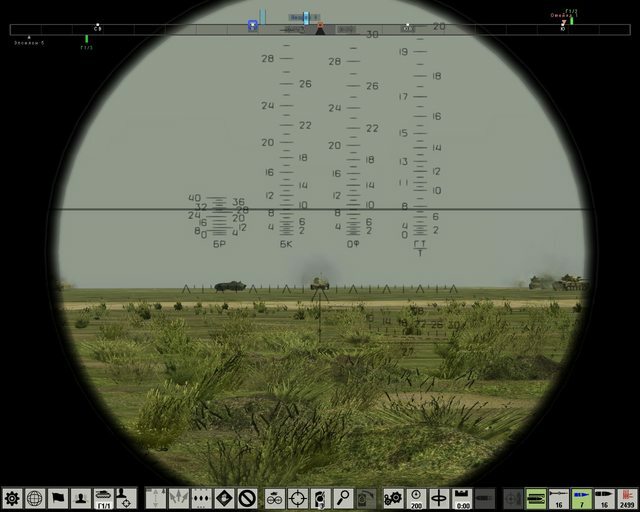 Reticle scale consists of the triangle and dashes, the screenshot indicates corresponding ranges (the first line is APFSDS-T 3BM3, the second - HEAT-FS 3BK4 and HE-FRAG-FS 3OF11, and the third - coax machinegun PKT). Fire from the gun - left click or Space, coax machinegun - right click or Q. Last edited by Krabb; 11/29/12 05:05 PM. 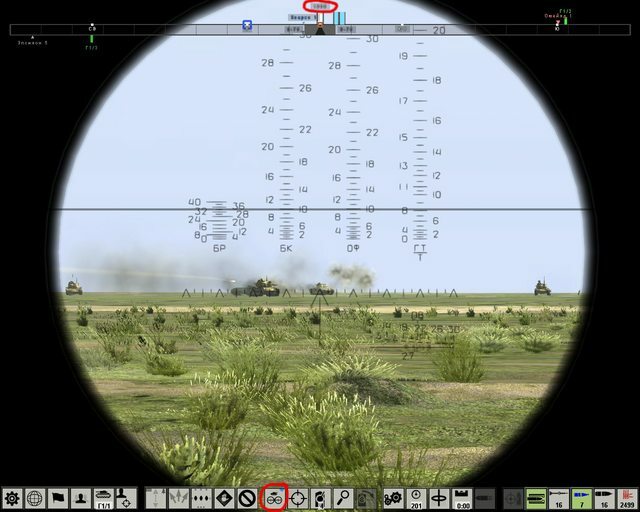 M60 tank commander (F7) has the coincidence range finder, which combines accuracy with speed in determining range. Look in sights - V key, switch to the range finder - Z and C, look closer - Backspace. 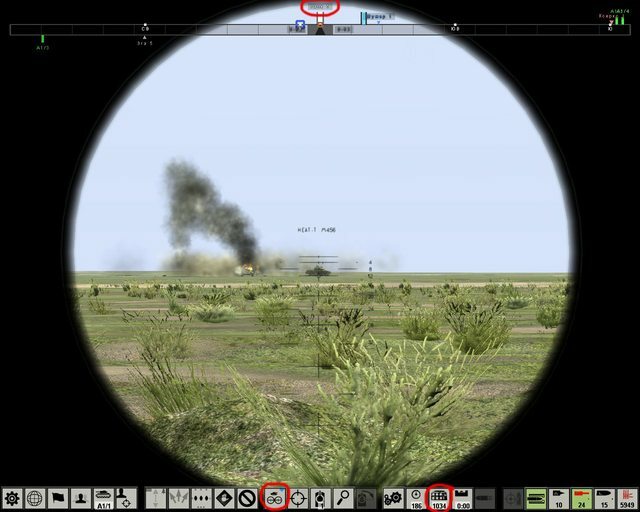 Switch to partial or full control of fire from the commander's place (marked icon) - key 5. 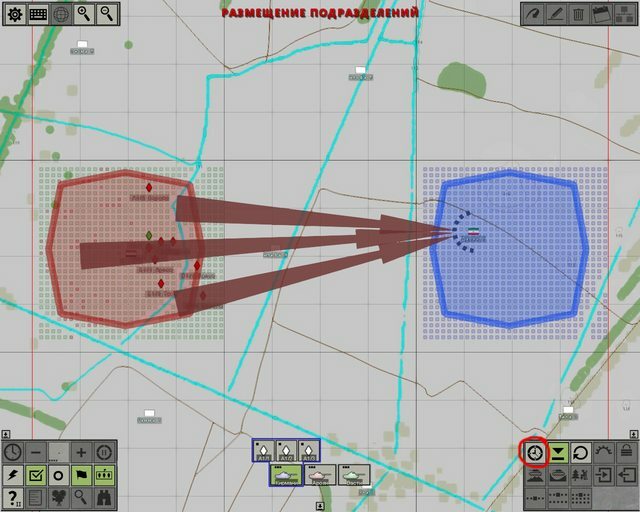 By rotating the mouse wheel or by pressing Insert and Delete keys (hold Shift for larger steps) merge two target images, the range to the target will be determined automatically. 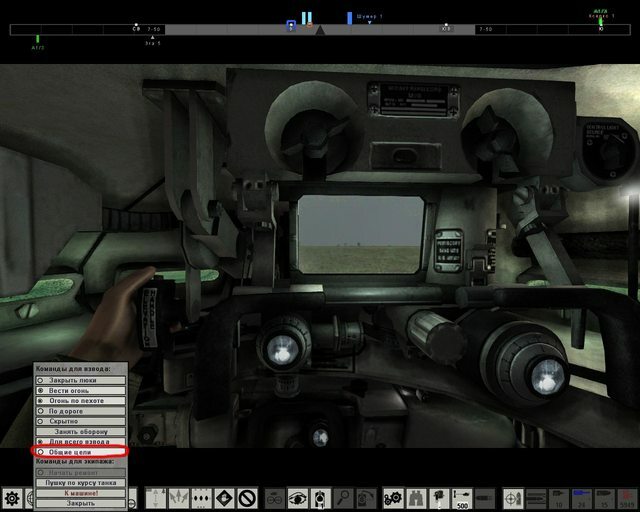 The range is displayed on the marked icon (the range designated to the gunner) and on the indicator to the right of the commander. Last edited by Krabb; 11/29/12 05:07 PM. In gunnery the unit of angular measurement is the mil. 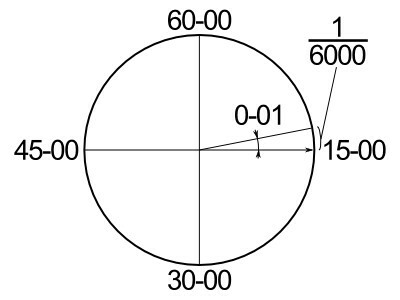 The mil is equal to 1/6400 of a circle (NATO; 1/6000 - ex-USSR). Mils facilitate easy and rapid conversion from angular units to linear, and vice versa, since the arc length corresponding to one mil equals one thousandth of the radius (distance to the target) at all distances. For example, at a distance of 500 m one mil equals 0.5 m, at 1 km - 1 m, 1.5 km - 1.5 m, etc. Knowing the size of the target and its visual angle, it is possible to determine the range to the target, or knowing the range and size, to determine the visual angle of the target, etc. where: D - range to the target in meters, A - scope size of the target in mils, H - height (width) of the target in meters. In ex-USSR angles in mils are usually written in two groups: first group - hundreds of mils, the second - tens and ones. E.g., 1 mil is 0-01, 100 mils is 1-00, etc. Enemy tank, width 3.5 m, visible at angle about 0-04. Determine the distance. D = -------- = ---------- = 875 m.
Last edited by Krabb; 11/30/12 04:43 PM. Last edited by Krabb; 05/06/12 11:21 AM. Brilliant Krabb - well done mate. Going to study this a bit more in depth when I get home from work. Then it'll be 3 or 4 bags. Who's fifth? Yeah, i remembered Israeli movie "Lebanon". Their Sho't (if I'm not mistaken) had enough space first for killed soldier, then for a Phalangist, and then for Syrian captive. I guess Sho't (just as Centurion) uses its space not very efficiently. Last edited by Krabb; 04/23/12 04:56 PM. Is it possible to determine range somehow with the TPN-1-41-11 night sight as there is no range scale as per the daytime sight (i.e. the curved line going from 800 upward). 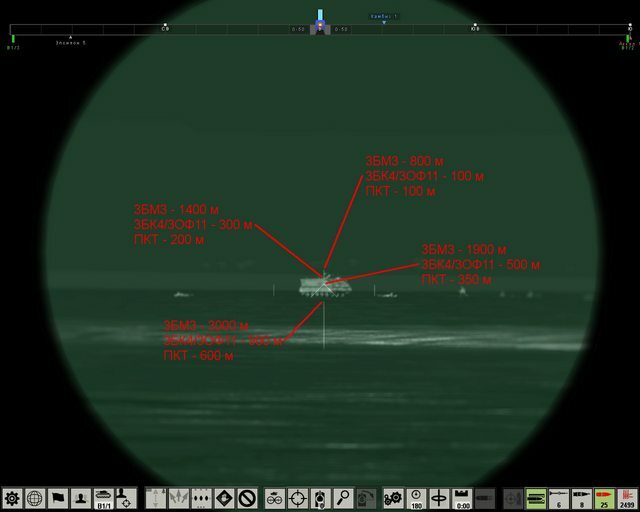 I find it quite strange that the TPN-1-41-11 sight goes up to 3000m yet you probably couldn't see that far with the IR night light - or could you?